The TAPA Trade Series is Taking Off! Win 1 of 2 Full Passes to the OCFF Conference and Gala Dinner! 2012 TAPA Fundraising Raffle Winners Announced! Buy Time on Our LCD Screens And Promote your 2012/2013 Season! Announcing a New Partnership with TheatreBooks! Our ongoing professional development series continues via the TAPA Trade Series. Last month we began with the annual First Aid Workshop (sold-out) and we continue this month with no less than three (3!) workshops. Be sure to read Alexis’ section in the Communique this month for full details. There are numerous conferences coming up and TAPA is pleased to be a partner in the 25th Annual CAPACOA conference “The Culture of Place”, January 23 – 26, 2013 here in Toronto. CAPACOA expects to see over 250 presenting organizations, artistic companies, artist managers and agents from across Canada and the United States convene for national face-to-face business, networking and professional development opportunities. It is a destination for leaders from the sector – both established and emerging. CAPACOA will announce its 2013 conference programming in the fall with information regarding panels, keynote speakers and performances. TAPA member companies will have an opportunity to register for showcase performances specifically for CAPACOA. More information about registration to follow soon.. TAPA is also providing box office services for the CAPACOA conference and working to secure show listings from the TAPA membership. If you are interested in providing tickets to your show for CAPACOA delegates please contact Scott for more information. Another conference that TAPA is pleased to promote is the OCFF Conference. We are pleased to offer a pair of passes from a generous donation by TICKETPRO. Would you like to attend the 26th Annual OCFF Conference and Gala Dinner? Would you like to attend for free? If yes answer the following question and email your answer to Alexis by 12:00noon on Wednesday October 10, 2012. What was the name of the conference that TAPA hosted In April 2012? The first two correct answers will receive the conference passes. Want to learn more about TAPA’s programs and services? Are you a new TAPA Member? Are you a new employee of a TAPA Member company? Come to a October Members Meeting. RSVP to Alexis at least 2 days prior to the meeting you wish to attend. TAPA Board Member Jim Roe witnessed the draw which was conducted at the TAPA offices on Tuesday September 4, 2012. The beginning of the 2012/2013 season is here and we have plenty of local theatre, dance and opera lovers, tourists and families visiting the T.O.TIX Booth looking for something to see. Now is the time to advertise your show at Yonge Dundas Square on the T.O.TIX LCD Screens and get noticed. Rates for as low as $100.00 per week! Please contact Bill van Heerden, Sales Manager at T.O.TIX, at billvh@tapa.ca to book your screens now. Location: All orientation sessions will take place at the TAPA offices located at 215 Spadina Ave, Suite 210 (Press 2R on the elevator). Please RSVP to Alexis Da Silva-Powell, Corporate Partnerships and Membership Manager at alexisdsp@tapa.ca. Register all of your shows for the coming season as soon as you can! Remember that Dora registration forms must be submitted 21 days (3 weeks) before your show opens. After this final Orientation Session (on Wednesday October 17 1:00pm to 2:30pm), the 21 day deadline will be strictly enforced with no exceptions. hipTIX is pleased to announce a new partnership with TheatreBooks. As you know, during my frequent in-school outreach visits, students are encouraged to sign up for the bi-weekly hipTIX newsletter. Beginning this month, one lucky draw winner pulled from the previous month’s sign-ups will win a pair of Canadian plays, generously provided by TheatreBooks. In addition, the draw winner will receive a pair of complimentary tickets to one of either Tarragon Theatre, Theatre Passe Muraille or Factory Theatre’s shows on a rotating monthly basis. Monthly winners will be announced via the communique as well as the hipTIX newsletter, Facebook and Twitter feeds. Keep an eye out for September’s winner soon! The TAPA Advocacy Committee has been working hard to prepare for Arts Day at the City on Tuesday November 13, 2012. Throughout the day, arts leaders and advocates will be meeting with city councilors to relay this year’s arts message As part of Arts Day at the City we will be presenting the TAPA Stats Report Phase 3 in the Council Chambers at City Hall at 10:30am. We hope to see you all at the presentation; in the meantime, if you would like to meet with a City Councilor, please contact Jacoba. What is The Theatre Centre? The Theatre Centre is an arts incubator located in the Toronto’s West Queen West neighbourhood. Our programming challenges the definitions of theatrical performance by embracing music, dance, visual art and new media. We work to emphasize artistic process over product, to nurture artistic agitators, invest in ideas and to champion new work and new ways of working. It is important for us to foster a culture of innovation by embracing risk and questioning traditional notions of failure and success. This fall we will present Boblo (November 22-December 2), a theatre piece inspired by memories of an amusement park of the same name in the middle of the Detroit River. Created by Erin Brandenburg and Andrew Penner, Boblo has been developed in Residency at The Theatre Centre since 2010. Co-produced by The Theatre Centre and Kitchenband Productions, this ghost story in a rock concert setting will be a treat. We have been able to watch Boblo develop from an idea to a production – it is a brilliant example of what we do, and what we value most. This fall we begin renovations on a new permanent home inside the historic Carnegie Library building at 1115 Queen St. West. Just steps from the Great Hall, the space that housed The Theatre Centre for the past decade, and the temporary Pop-Up space we are in now, this neighbourhood landmark will be transformed into a community and live arts hub. This project will be truly transformative for the company, the local neighbourhood, and the artistic community that thrives here. Led by current General & Artistic Director Franco Boni, our board and staff have worked tirelessly to be able to make this dream a reality. After 33 years of a nomadic existence, we are thrilled to finally have a permanent home. It has been a years-long journey that tells a compelling story about the kind of city that Toronto aspires to be: innovative, diverse, collaborative and inclusive. 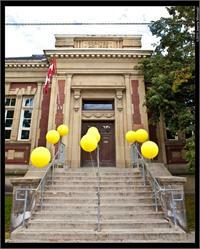 We kick-off the renovation with a Groundbreaking Ceremony on October 11, 2012 at 11am – please join us to celebrate this wonderful occasion on the steps of the Carnegie Library building at 1115 Queen West.